Quinoa Tabbouleh Salad. Green goodness and varying textures in every single bite. Flecks of fresh parsley and spinach run through a big bowl of bright roma tomatoes, crisp cucumber, and hearty quinoa. All tossed in a refreshing, citrusy dressing made from nothing more than lemon juice, extra virgin olive oil, some salt, & freshly cracked black pepper. What’s that old saying again? That cardinal rule of thumb…? As in – Keep It Simple…Sweeties? Yeah. I think that sounds about right. Or at least that’s the nicer version of how it’s going to go today. This salad comes together in less than 30 minutes and keeps well in the fridge for several days. It’s one of those rare salads that actually gets better the longer it sits because it gives the tomatoes and cucumbers even more time to soak up all that vibrant lemony flavor. This is an easy go-to for your weekly meal prep needs or for a make-ahead side salad that you can bring to a beach BBQ. Totally portable and great straight out of the fridge or enjoyed at room temperature, this versatile little salad goes great with fresh-off-the-grill chicken kabobs or fresh fish. Tabbouleh is “I can’t wait for it to be summer” kind of eats. The kind where no matter what sort of temperatures you find yourself facing until the warm weather finally hits, you can just plant your face in a heaping plateful of these happy colors and keep on pretending summer’s already here. I can’t make any guarantees that actual sunshine will make its way to you when you eat this but it might put you in a sunnier disposition! When I first started trying to make healthier eating habits stick, I made this salad a LOT. It was one of the only ways I was able to take that leap of faith into being a regular quinoa-eater. 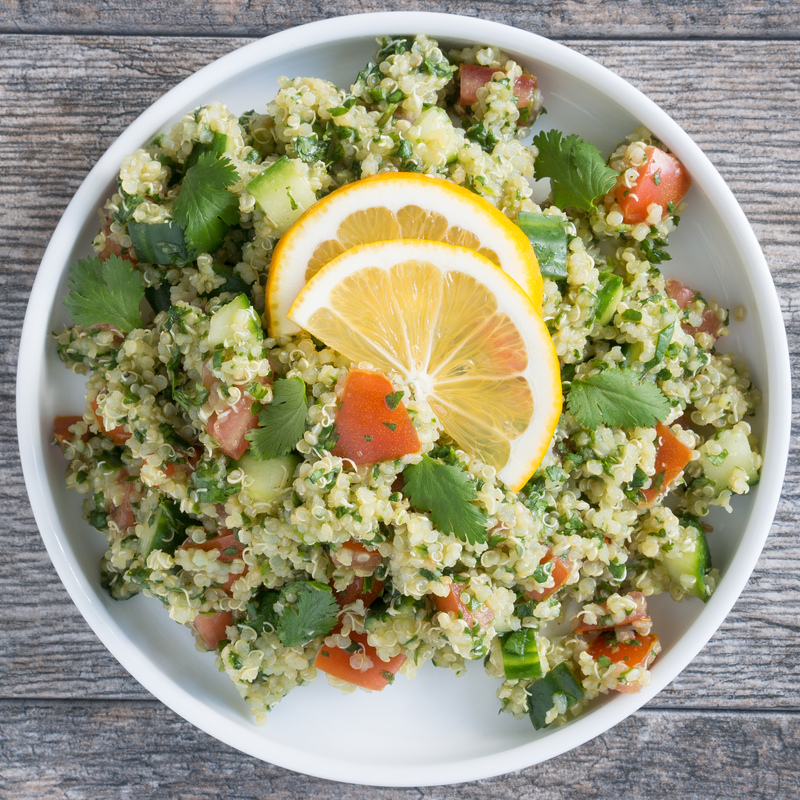 Traditionally tabbouleh is made with bulgur, or dried cracked wheat, but quinoa makes a great gluten-free substitute in its place. At the time, I was going through a brief period in my life where I thought that all things with wheat were horribly bad and was utterly convinced I needed to get rid of it in my diet. I had demonized any and all foods containing gluten and tried to whittle them out forever. This was short-lived and wasn’t something I found very sustainable for me personally. Since I don’t have any medical reason to avoid gluten, I have fully reincorporated it (as in embraced it with a lengthy “welcome BACK!” // I’m-never-letting-go kind of awkward, too-tight, clingy hug). But the good that came out of my gluten-phobia was that it pushed me to incorporate more vegetables into my daily routine and introduced me to lots new foods. 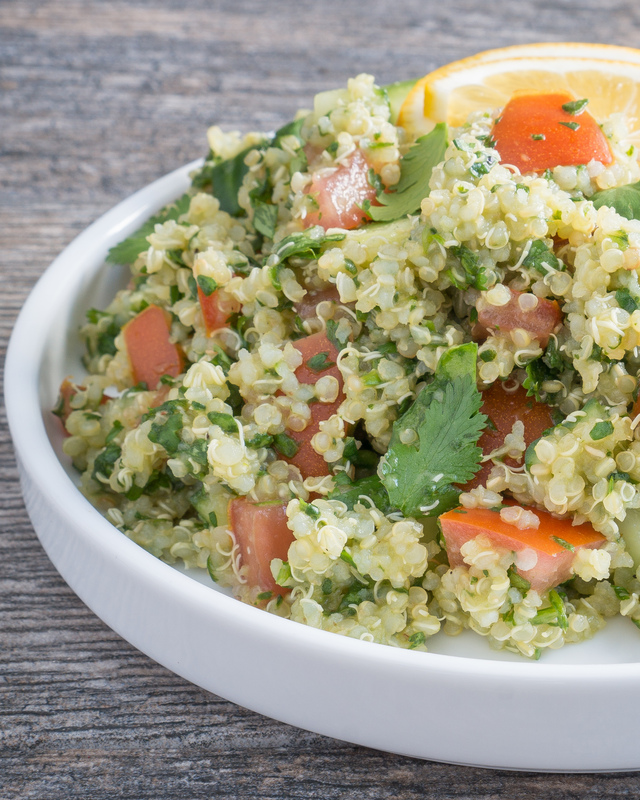 Like the oh-so-versatile alternative to the usual cooking grains – quinoa! And as it turned out, I really didn’t mind the stuff. To me, quinoa is like itty bitty rice with a mildly nutty flavor profile. But it’s just as versatile and gives me that “mmmm I’m eating CARBS!” // hip-hip-hooray sort of feeling when I eat it. All quinoa really needs is something to flavor it up and take it up a notch or two. Which is why I opt to cook mine in broth instead of just salted water. I didn’t mind it when it was cooked in water, but I also didn’t really love it either. Once I cooked it up in flavorful savory chicken broth though, I was SOLD. What a difference! This tabbouleh salad is slightly crunchy, tangy, herby, and full of texture. Most importantly, it is filling. This is my main criteria in what I look for in a good salad. Am I still hungry? Do I feel like I ate anything at all besides some wet leaves? The combined starchiness of the quinoa with the diced vegetables makes for a salad that feels genuinely substantial while you eat it. Plus we take care to remove the seeded sections from the tomatoes and the center of the cucumber before dicing them up. While these parts are totally edible and there’s nothing wrong with putting them in, I find that leaving these parts intact makes for a less crisp bite and the extra moisture these vegetables release can water down the whole salad. Taking a little extra time to cut and scrape them out will ensure you have those bold textures and prevents the dressing flavor from getting too muddled. This is a far cry from the limp, lifeless plain-Jane greens scenario that you might find yourself in when you order a house salad in a restaurant. And yet it’s not a heavy dish either. It walks that fine dividing line between the two extremes. All thanks to the light and simple lemon dressing binding it together and short list of ingredients. I like to eat mine either as a little side salad to get me from lunch to dinner or as a big salad. Stone cold, mixed with leftover rotisserie chicken, piled all on top of some more baby spinach. But it’s also great with some chickpeas and feta cheese if you’re interested in a landing yourself a tasty meatless Monday // vegetarian meal. We are still out on our long summer trip around the states right now, and it’s got me seriously missing my kitchen and fresh from the fridge ingredients to play with. Cold crisp vegetables just aren’t always in the cards when you are out camping in the desert heat. You can rest assured that this little number is going to be HIGH on my list of things to make and devour when we get back. So if you’re looking to revamp your own salad routine or you just want to make me insanely jealous that you are eating things I cannot currently eat, give this recipe a try! COOK THE QUINOA: Place quinoa and broth in a covered sauce pot. Bring to a boil, turn down to a simmer and cook for 12 minutes. Uncover and fluff with a fork, turn off heat and cover for 5 minutes. Put cooked quinoa into a large mixing bowl and set aside to cool. 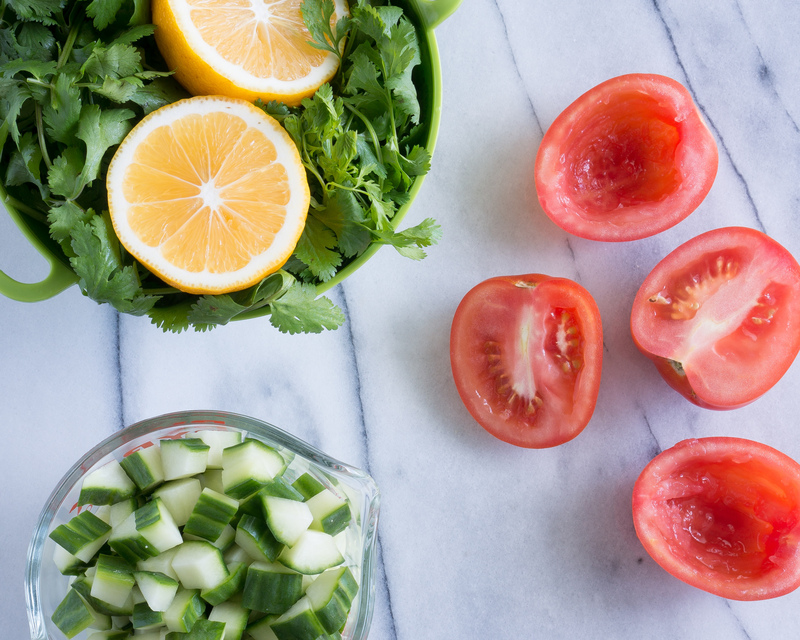 PREP THE VEGGIES: Cut the cucumber and roma tomatoes in half lengthwise. Scrape out the soft seed section in the middle of the cucumber and tomato halves using a spoon. This will help your final product be crisp, absorb the dressing better and not be overall watered down. Discard the soft stuff and chop remaining veggies into small cubes and add to mixing bowl with quinoa. 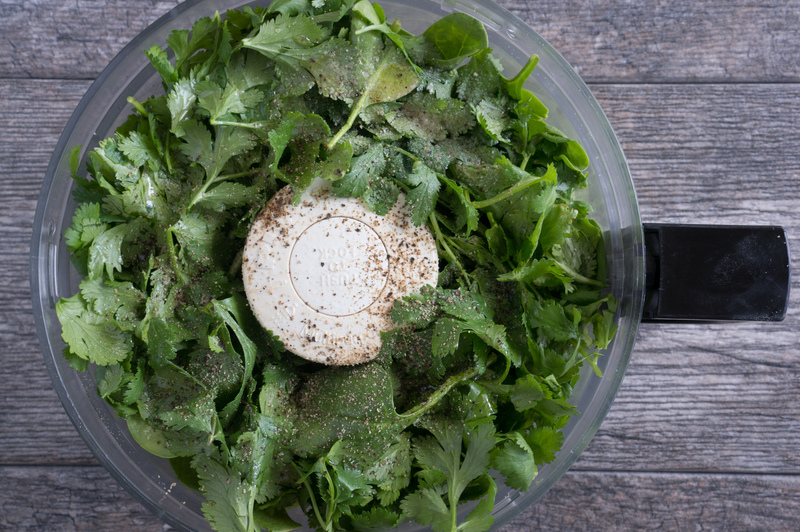 BLEND THE DRESSING AND GREENS: Place spinach, parsley, lemon juice, olive oil, salt, and pepper in a high powered blender or food processor. Pulse (do not blend) until chopped and well combined. Scrape down the sides of the bowl with a spatula as needed. Keep in mind that this should not be a puree. 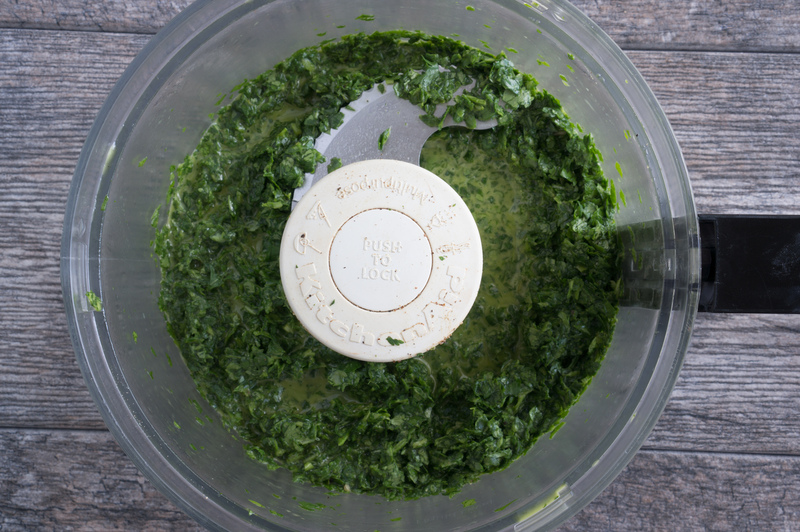 Alternatively, if you do not have a blender or food processor you can chop the spinach and parsley by hand and add the other ingredients to the herbs in a bowl. 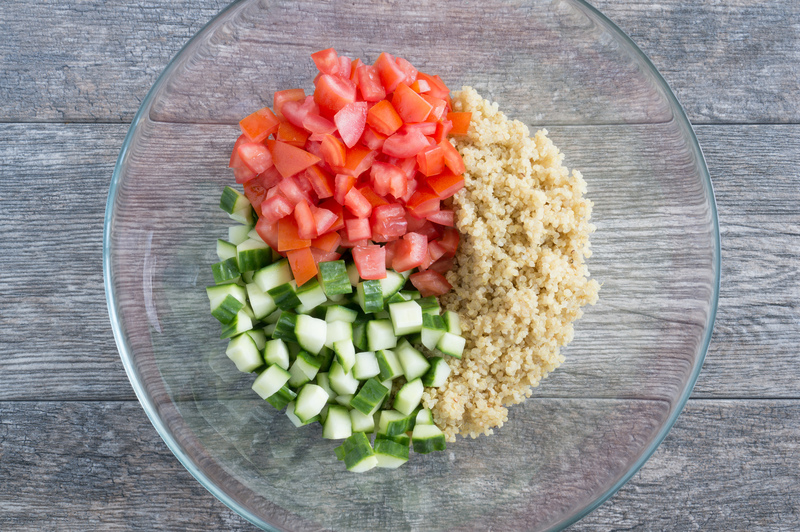 MIX TOGETHER AND CHILL IN FRIDGE: Pour dressing mix over top of quinoa and veggies. Mix together with a large spoon until well combined. Cover and refrigerate. This recipe is best served cold. If you allow all the flavors to marinate together for a few hours in the fridge (or better yet, overnight) it will taste even better.